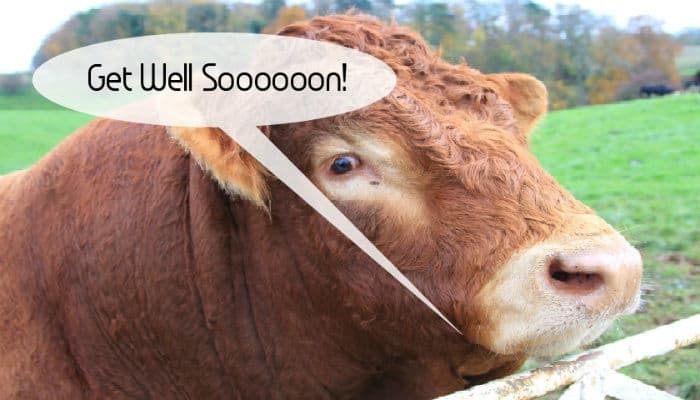 A get well message is a time when a little bit of humour is appreciated as the person who is under the weather will not particularly have much to smile about. You wouldn't generally send a get well message to somebody unless they were very poorly and were going to be off work for a long time, however, thankfully times have changed and those confined to barracks with flu will really appreciate you dropping them a message that is rather more personal than an email. These Cow Wishes business ecards are perfect for such times as this and the comical expression on the cows face will bring a smile to anyone's face. As these are sent electronically they can be picked up on a smartphone so it doesn't matter that they aren't at their desk. The message behind this ecard is simple; you care about the person you are sending it to. You feel sorry for them being ill at home and that you wish them a speedy recovery as you are missing them at work. You can add your own personal message to the ecards if it’s someone you work closely with or if you have been informed via email that you usual contact is off sick you can just put your name and company so they know who has been thoughtful enough to send them these ecards. Does your business celebrate the Christmas holiday by sending out ecards? If so then you won’t find better solutions than our market leading corporate holiday ecards.